May is such a wonderful month at our house. We get to celebrate our anniversary and my son’s birthday! 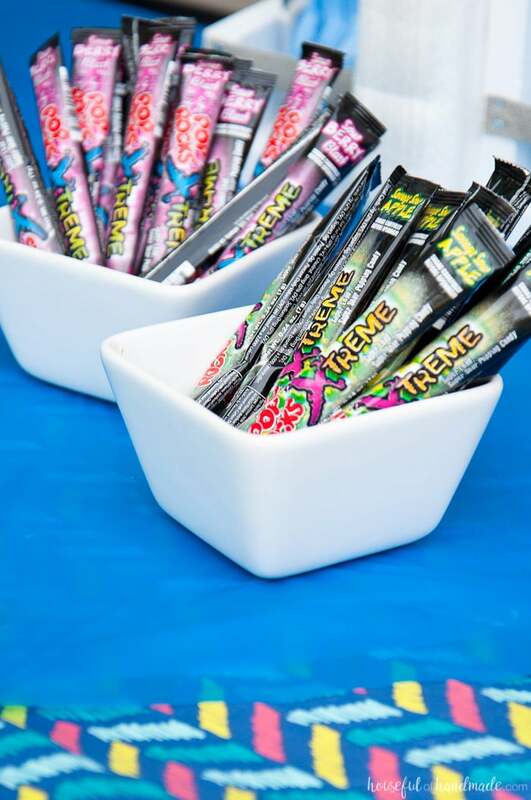 Every year I look forward to creating fun themed parties for my kids. They love being able to help select the activities, decor and games. And they especially love being the center of attention for the day. This year all my son wanted was a Science Birthday Party. I loved the idea and ran with it. It was one amazing party! WARNING: If you are a true nerd be warned, I had to fudge a couple of the elements to make the words I wanted for our science birthday party. Please do not hate me. My son knew exactly which ones I changed and thought it was pretty funny. I truly love my little nerd. That is what he calls himself. He loves all things science. The other day he read page after page of a reference book about minerals to me. I don’t remember too many details (maybe I wasn’t fully paying attention), but I guarantee he could spit those facts back to anyone who would listen. I always joke that he is the reason the Discovery channel is made. 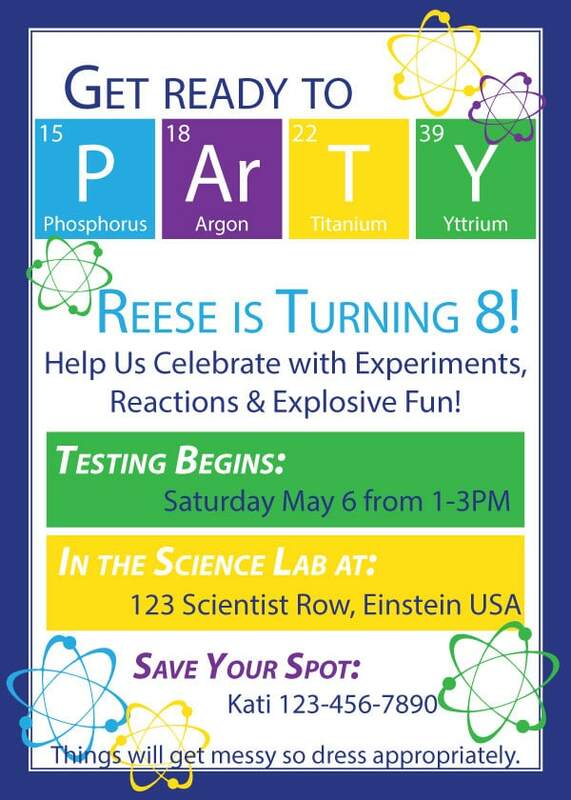 It didn’t surprise me one bit when he was so very adamant about having a science birthday party this year. He loves creating experiments of all kinds, but mostly anything that will explode. So I decided to make the party a bunch of experiments for him and his friends to enjoy together. And I made sure to include plenty of messy and exploding experiments. 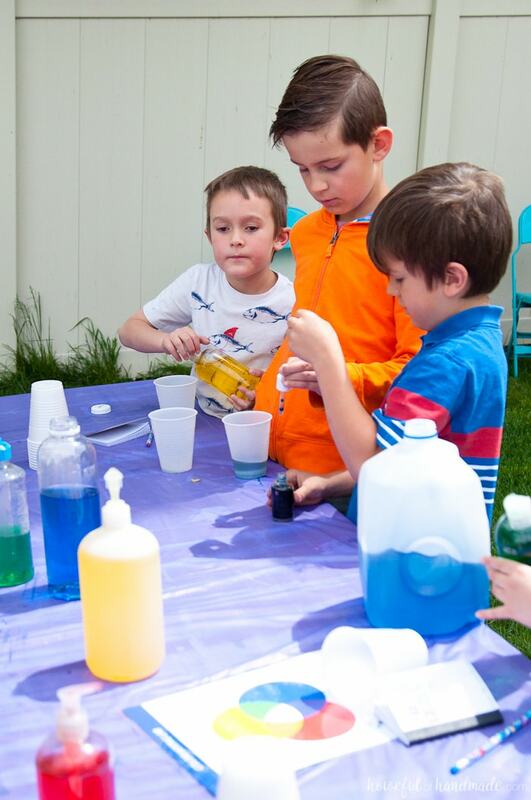 We started off with a science themed birthday party invitation. I let people know what the theme of the party would be (and of course included a warning about the mess that would be happening). My son thinks it is awesome to use the periodic table of elements to write words so I used it to make the invitation. When I asked for his input on what experiments we should do, all he wanted was a volcano! I used that as a jumping off point. 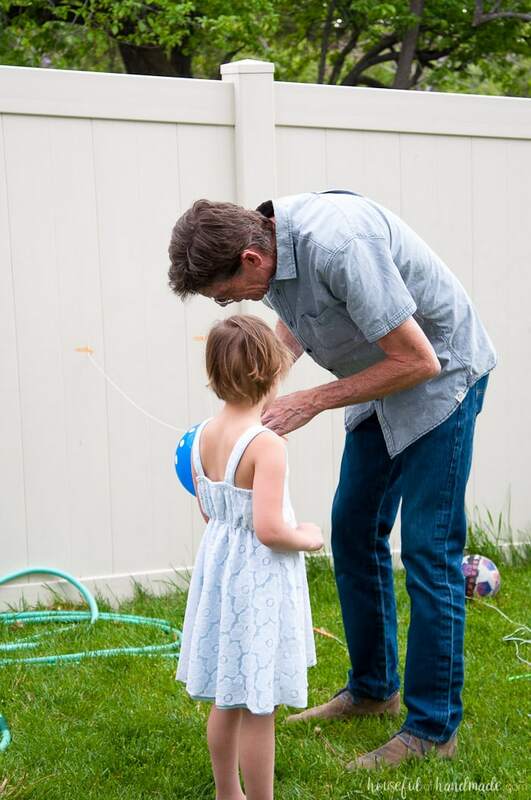 I didn’t want things to be too complicated (we have a lot of close friends that are younger than my son). So I decided on 4 different experiments for the kids to do: a color mixing lab, volcano experiment, balloon racers, and homemade floam. Sadly our floam was a bit flop so I am not going to include the info for it here . I do need to find a new recipe because I may have promised some of the kids we would try again this summer (and kids never forget stuff like that). To set up the party I kept things pretty simple. Since we were doing science experiments with a large group of kids we planned the party outside. 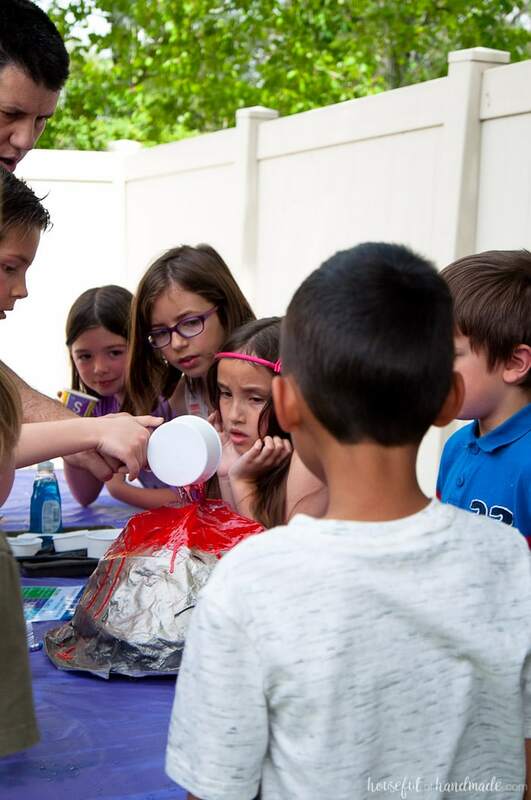 Luckily our crazy Utah weather even cooperated this year and we were able to enjoy some warmth and sunshine for the science birthday party. 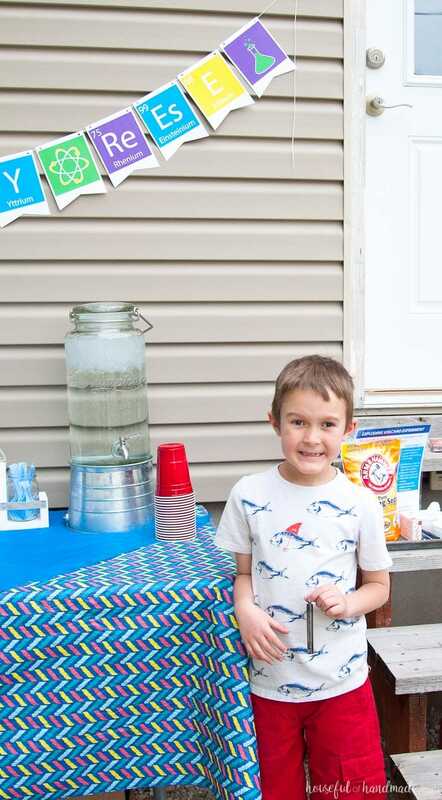 We set up one table with the treats, which included cupcakes (chocolate with chocolate frosting as requested by the birthday boy), extreme sour PopRocks, Homemade Root Beer and of course ice water because we would be outside in the sun. Also on the table I had a stack of science party books and scratch-n-sniff pencils. Each kid got their own science book and pencil when they arrived so they could jot down their scientific findings. Some of the kids took this very seriously and went home with all kinds of notes. I loved it! 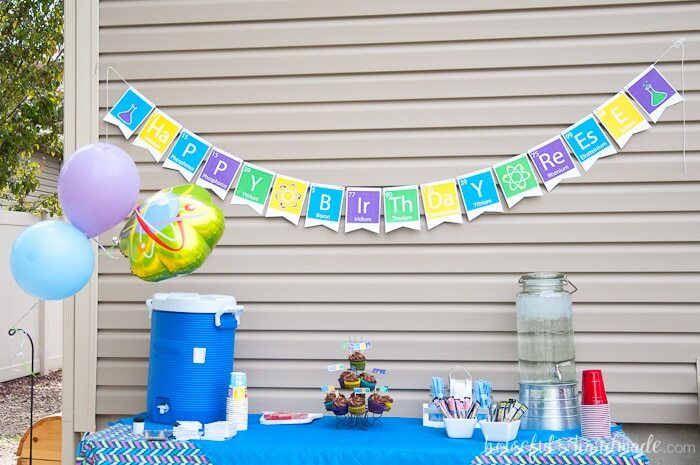 I also made a Science themed Happy Birthday banner for behind the table. Again, I used the periodic table of elements to write the words. Then I printed them out on regular paper and used spray glue to adhere them to some pennants I cut out of white cardstock. It was a super quick banner DIY that my son still has hanging in his bedroom (and probably will until new year). I planned out the 4 different experiments. I made these fun science experiments cards with a list of supplies and directions and questions for each one. Then I printed them out and laminated them so they would last through the entire party. Then I put all the supplies needed for each experiment on a sheet pan with the experiment card. Now they were ready to go when it was time to switch from activity to activity. We started with the color mixing lab. 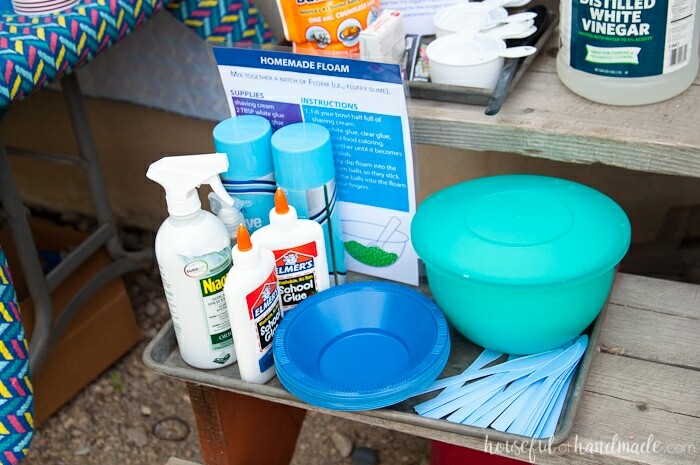 This is such a fun activity for kids in the summer and super easy to set up, the only problem is you have to plan ahead a little bit and save all your empty bottles. It is also a great activity to start with because kids can play with it while you are waiting for everyone to arrive. They could seriously play with this one for hours, it is that much fun (go ahead and try it yourself). 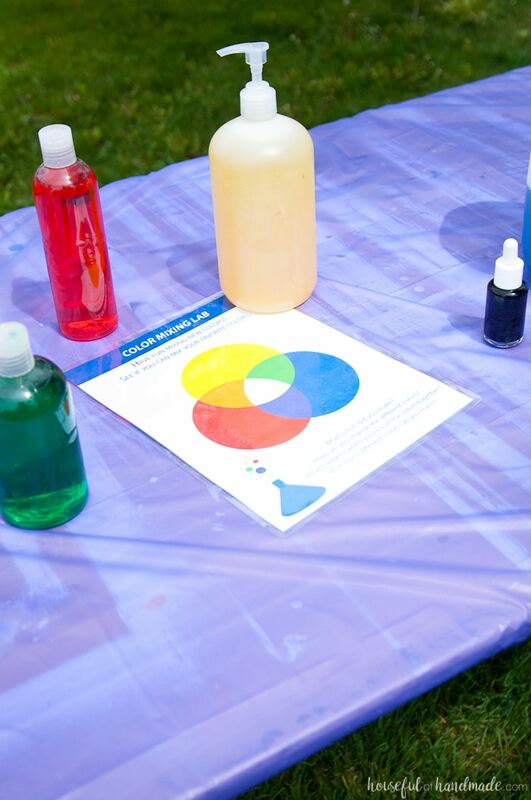 To set up the color mixing lab, clean out all the empty bottles you can get your hands on. The more kids you have the more bottles you will want. 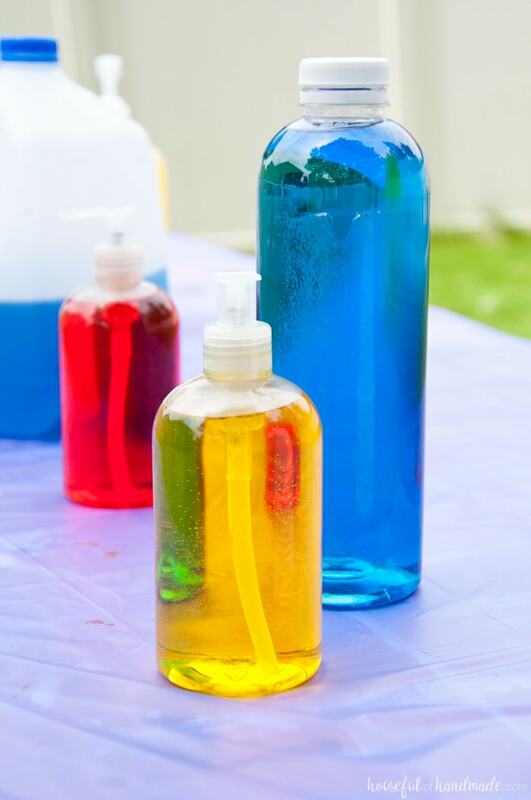 Bottles with squirt tops, pumps, and even dropper tops are the best because the kids have fun getting the water out. Then fill all the bottles with tap water and add food coloring. I stuck to the basic red, yellow, blue and green that come in the food coloring box. We had at least 2 bottles of each color. Then add a stack of see-through plastic cups and let the kids see what colors they can create. After they had used all the colored water, twice, we moved on to the volcano. The week before the party my husband and son made a paper-mache volcano around a dollar store vase. They had so much fun building and painting it. For this activity I put 3 different experiments on the experiment card. The instructions told them to try out the 3 different experiments to see what worked best. They all gathered around the volcano so close I can’t believe they weren’t all covered in baking soda and vinegar. The husbands ended up jumping in to help direct the children but everyone still had a blast. We ended up exploding the volcano quite a few times! Next up was balloon racers. I left the instructions pretty vague on this experiment because I wanted the kids to use their brains and see if they could come up with some different ideas. 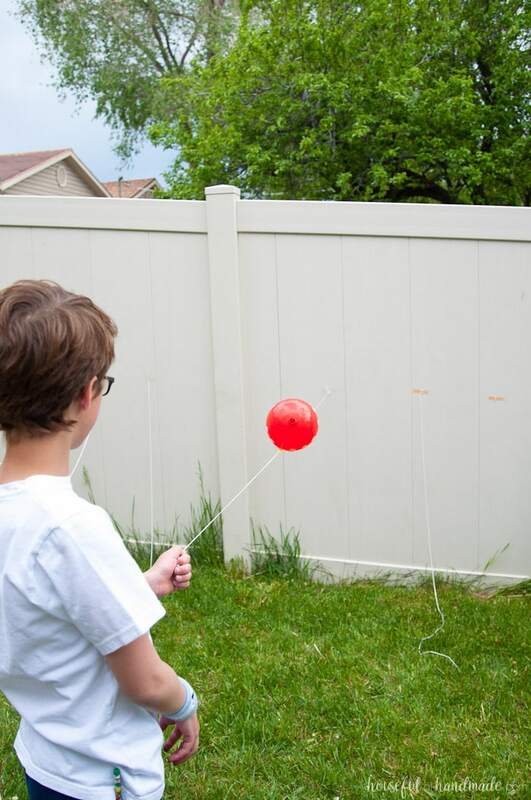 We had a one kid try to add 2 balloons to make it go faster, but didn’t have much success. Also, I would recommend masking tape for this experiment over scotch tape. I lost my masking tape while setting up and was a bit bummed the balloons weren’t sticking as well as I had hoped. Even with the tape challenges, the kids had a blast playing with the balloons. Some of them got their racers up and going, and others just saw how big they could blow up the balloon before it popped in their face. It’s all science either way! The last experiment was floam. Sadly no one got their floam to work, we ended up with lots of colored shaving cream. I think our recipe needed a lot more glue to pull everything together, or maybe my liquid starch wasn’t the right stuff. The kids had fun playing in the colored shaving cream anyway. After the experiments were all over, we enjoyed cupcakes and root beer floats with our homemade root beer. The kids had a blast and my son has been talking about his party all week so I think it was a huge success. 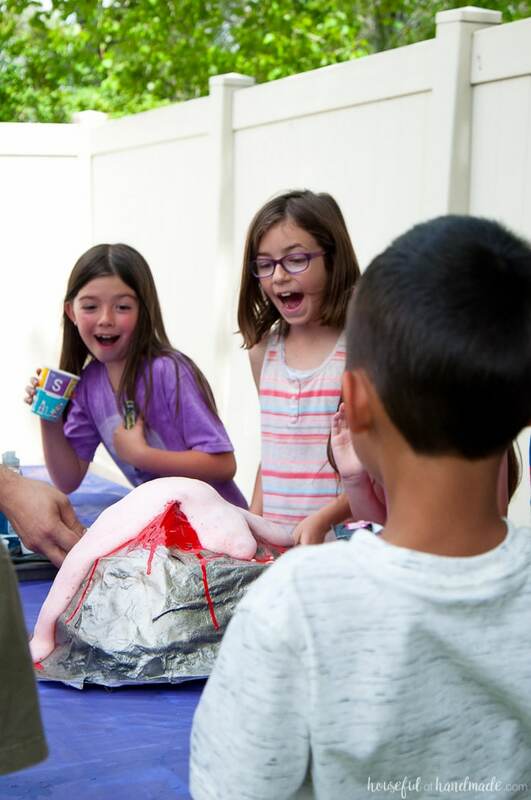 If you have a little nerd you want to through an epic science birthday party for. 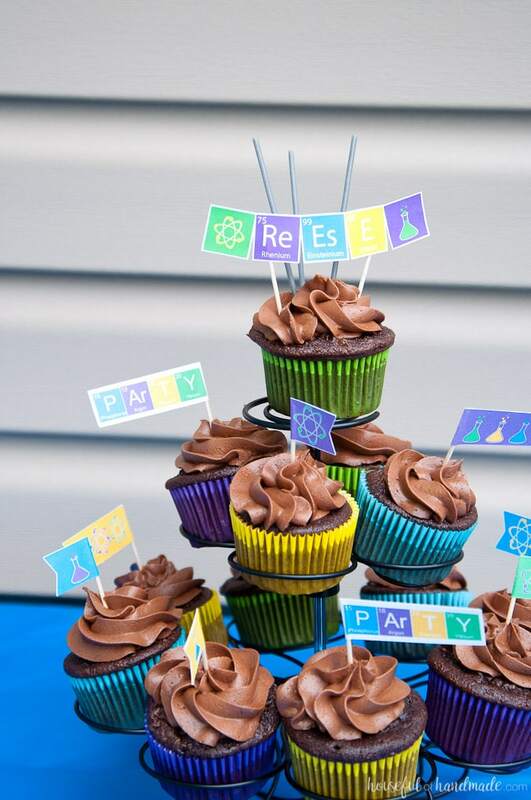 I am sharing all the printables I used for our science birthday party in the library of free downloads for my email subscribers. 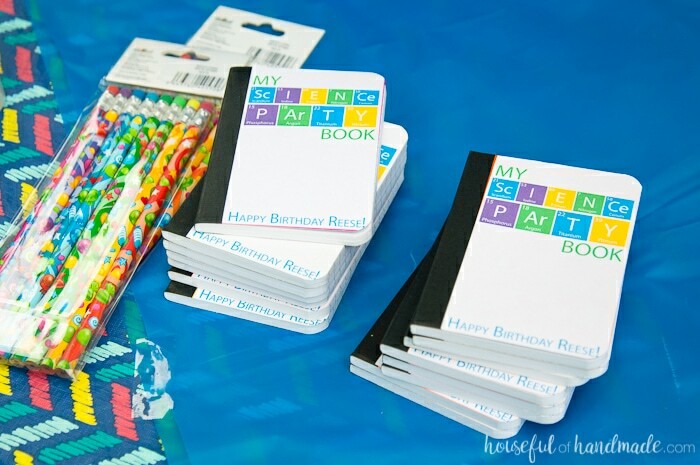 I have included the invitations, cupcake toppers, Happy Birthday banner, party book cover and 3 science experiment cards. 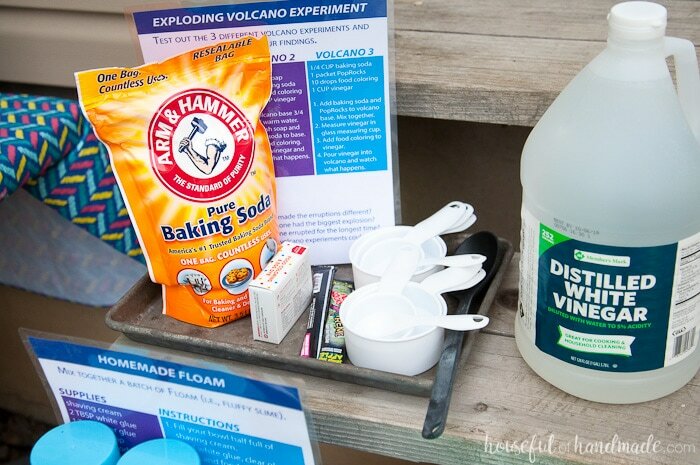 Everything you need to through your own science birthday party! You can click here to subscribe to the weekly newsletter and gain access to the library today! If you already have a password, click here to access the library. Nice pictures. Newton Show is one of the best science show in Singapore which allow kids to explore the science world with some real science base experiments. It is a combination of both education and entertainment.